Ambrose Powell Hill, Jr. (1825–1865) was a career United States Army officer who resigned and served as a Confederate States Army general during the American Civil War. He started his military career in 1847, graduating from the United States Military Academy at West Point, 15th out of a class of 38. While at the academy, he and his roommate George B. McClellan became close friends. He served during the last part of the Mexican-American in Texas. He served during the Seminole War of 1849-50 in Florida. 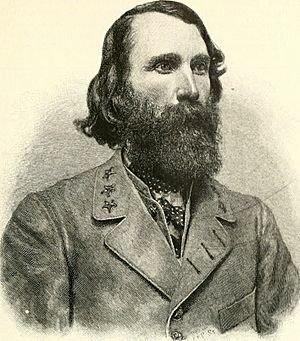 Hill is best known for commanding the "Light Division" under General Thomas "Stonewall" Jackson. The Hill family had come to Virginia two centuries before the Civil War. The earliest family members (then spelled "Hull") traced back to 12th century England. Henry and William Hill of Shropshire came to Virginia in 1630. They settled in Middlesex County, Virginia. Both brothers were tobacco farmers and both had large families. In 1740, Russel Hill, William's great-grandson, moved to Culpepper County, Virginia. His son, Henry Hill served in the American Revolutionary War under Colonel Henry "Light Horse Harry" Lee. His son, Thomas Hill, was a farmer, merchant, and politician. He married Fannie Russel Baptist. Together they had four sons followed by three daughters. Their fourth son was Ambrose Powell Hill, Jr.
On November 9, 1825, Ambrose Powell Hill, Jr., was born at Greenland, his father's plantation near Culpepper, Virginia. But all throughout his childhood he was called Powell. He went to the local schools. Hill wanted to go into the military and in 1842 he was admitted to West Point. But he did not graduate in 1846 with the rest of his class because he missed a year due to illness. Graduating in 1847, he was posted to the U.S. 1st Artillery. After serving in the Mexican-American War, he was sent to Texas, then Florida. Hill came down with Yellow fever, typhoid fever, and malaria. During the 1850s he was sick much of the time and was confined to his bed. When he recovered he was assigned to the Coast Surveying Department (now the U.S. National Geodetic Survey). As Abraham Lincoln was inaugurated in March of 1861, Hill was among the U.S. Army officers who resigned their commissions and joined the Confederacy. He was given command of the 13th Virginia Infantry with the rank of colonel. At the First Battle of Bull Run, his regiment was held in reserve. In February 1862 he was promoted to brigadier general. In the Peninsula Campaign he fought against his former West Point roommate, Union General George McClellan. Proving himself as an aggressive leader he was promoted again on on May 26, 1862. This made him the Confederate Army's youngest major general. Hill called his division "the Light Division" even though it was one of the Confederate Army's larger divisions. This was probably because of how fast Hill could move his troops. He was known as a fearless general and was often seen in battle at the front lines. Without any encouragement from Hill, he was being regularly written about by a former aide, John M. Daniel. Wounded, Daniel had left the army and was now the editor of the Richmond Examiner, a three-cent newspaper popular with Confederate soldiers. Soon, Daniel was making Hill out to be Lee's top general to the exclusion of other generals. This did not sit well with Lieutenant General James Longstreet, Hill's commanding officer. The final straw came in the July 2nd edition of The Examiner. Daniel wrote that Hill had taken command of all of Longstreet's forces when Longstreet was absent from the battle for a period of time. Longstreet was angered at this and saw it as a lie. Longstreet decided to write his own article refuting Daniel's claims about Hill at the battle. In a rival newspaper, the Richmond Whig, Longstreet directed Major Moxley Sorrel to submit a public response under Sorrel's own name. This started a very public feud between the two generals. Lee became aware of the feud but decided not to do anything about it. When Hill refused to read any dispatches sent by Sorrel, Longstreet's aide, Longstreet became furious. He ordered Hills arrest. While under arrest, Hill's Light Division was commanded by generals J.R. Anderson, then Lawrence O'Bryan Branch. At this point Hill regarded this as questioning his honor. The two kept up hostile communications and a time and place was selected for a duel. At this point, Lee stepped in and made the two generals come to an agreement. Hill was restored to his command and was assigned to General Stonewall Jackson in the Shenandoah Valley. As time passed, Hill and Longstreet became friendly again. Sorrel was later promoted to major general and found himself under the command of Hill. At the Battle of Cedar Mountain in August 1862, Hill proved himself valuable to his new Corps commander. His Light Division played a key role in helping Jackson win a victory over the Union army. At the Second Battle of Bull Run, Hill's division nearly ran out of ammunition but stood their ground against every Federal attack. At the Battle of Chancellorsville in May 1863, Jackson ordered Hill's division to the front in preparation for a night attack. Meanwhile Jackson was personally doing reconnaissance. As he returned he was fired on by his own men, mortally wounding the general. J.E.B. Stuart took over command and called off the night attack. Chancellorsville was a Confederate victory. Hill was promoted to lieutenant general after Jackson's death and was now in command of Lee's Third Corps in the Army of the Potomac. Hill's corps was at the Battle of Gettysburg from July 1-3, 1863. He was criticised for making questionable decisions. On the first day he engaged the Union before all of the Confederate army had arrived. At the Battle of Bristoe Station on October 14, 1863 Hill's Corps attacked two Union corps who were slowly retreating north. Hill's mistake was in not ordering any reconnaissance before the attack to see what they were up against. One of Hill's divisions was badly beaten and one artillery battery was lost. After reinforcing his line Hill was not able to make any progress against the Union corps who were dug in behind the Orange and Alexandria Railroad embankment. After beating Hill, the Union army continued on to Centerville, Virginia. Lee was angry with Hill over his mistakes at Bristoe Station. He told hill, "bury your dead and say no more about it!" On May 5, 1864, at the place known as the Wilderness in Spotsylvania County, Virginia, Confederate and Union forces battled for two days. Hill's Corps battled two Union corps both days and were on the verge of falling back when Longstreet's Texas Brigade reinforced Hill and pushed the Federals back. Hill was killed on April 2, 1865 at the Third Battle of Petersburg. He was just returning from sick leave and riding to the front to join his men when he was killed by a shot from an enemy soldier. A. P. Hill Facts for Kids. Kiddle Encyclopedia.